I was a little surprised when I asked my son what kind of cake he wanted for his birthday this year and he responded with a familiar response: Penguins! At least penguins are fairly simple to create. We decided on an igloo cake with penguin figures. 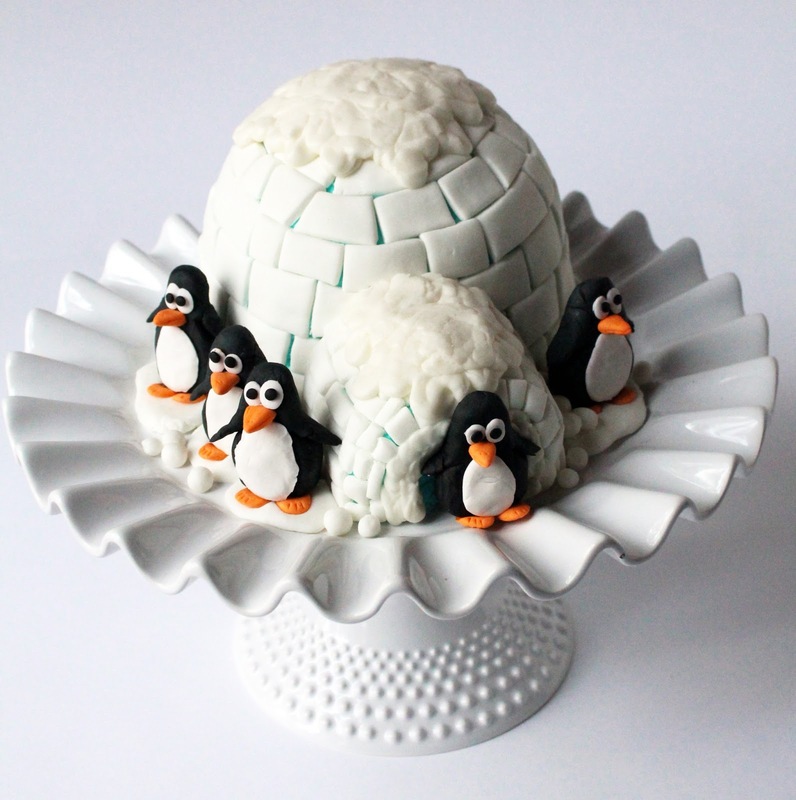 I am going to show you step-by-step (or waddle-by-waddle) instructions to build this darling little igloo cake with gum paste penguins. The cake serves approximately 12 people (excluding the front of the igloo). 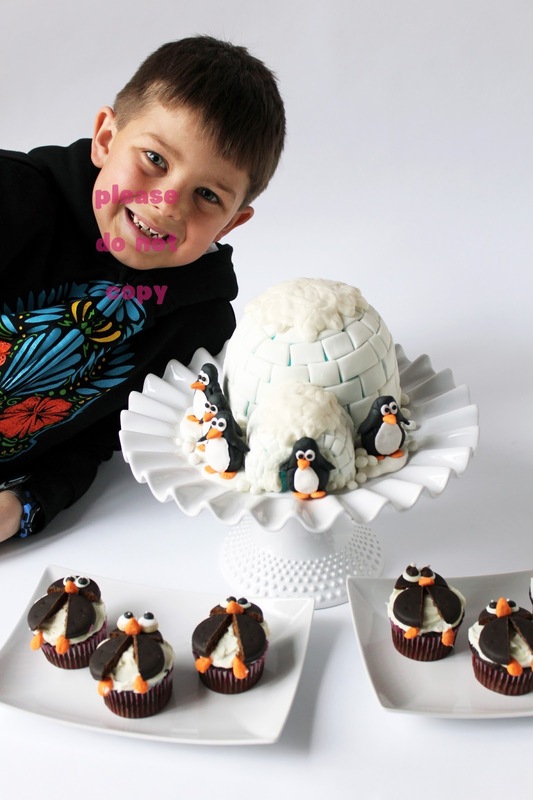 Here is an excellent video by Cake Makery on how to sculpt the penguins, or you can follow the photo guide below. Supplies to make the penguins: Wilton's Gum Paste, black food coloring, orange food coloring, toothpicks (to apply food coloring to gum paste if you don't have a squeeze top bottle), plastic wrap, shortening, scissors, Exacto knife, black sprinkles, paint brush, water. First, mix black and orange gum paste and leave some white. My hands turn a lovely shade of fuscia when I mix black fondant or gum paste. It usually wears off after a few rounds of dishes or a nice hot bath. Make sure you plastic wrap the gum paste until use. It dries out quickly. If the gum paste is really sticking to your hands, grease your hands with shortening. Cut slits on the side body of the penguins for arms. Place white gum paste details: flattened oval gum paste for the belly and eyes. If needed, brush a little water on the backside to adhere to the penguin. Sometimes I use a dab of frosting instead of water. Add the orange gum paste details: cone/triangle beaks and flattened cone feet. Then place the black sprinkles for the eyeballs. On to the cakes. Mix cake. Grease & flour one 6" round cake and a dome-shaped, oven-safe Pyrex bowl (of the same 6" diameter) for the top of the igloo. Foodnetwork.com has a nice photo guide here. Note: I have two extra 6" round cakes for another cake. I also baked 18 chocolate cupcakes with the remaining cake batter from the double recipe. The 6" rounds baked 350F for 25 minutes and the dome cake baked 350F for 35 minutes. Oven times may vary. I mixed a batch of buttercream frosting and tinted it sky blue for the crumb coat of the igloo. Spread a layer of frosting between the 6" round and the dome cake. Then crumb coat (thin layer of frosting) the rest of the cake. For the entrance to the igloo is constructed using a cake donut cut in half and stacked side-by-side. Crumb coat the donuts as well. Then into the freezer while we mix some fondant for the snow blocks. 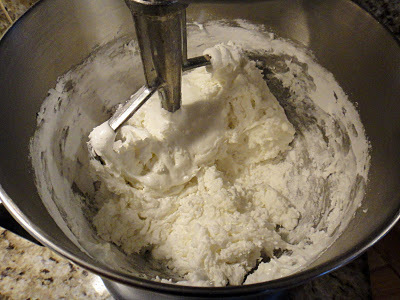 For the fondant, melt 1pkg mini-marshmallows with 3-4T of water and add to a greased mixing bowl and paddle. Add 2lbs of powdered sugar. Mix until combined. 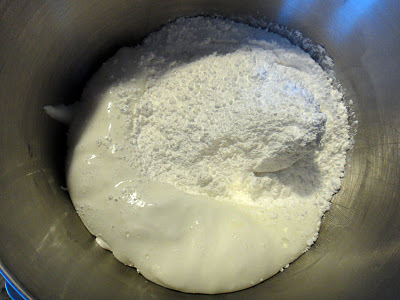 Remove from bowl and knead the mixture on a greased surface until smooth and pliable. If too sticky, add more powdered sugar. If too dry, add more water. Roll fondant on a surface lightly dusted with powdered sugar. Use a knife or pizza cutter to make 1/2" to 3/4" strips of fondant. Then slice the strips into rectangle shaped blocks. 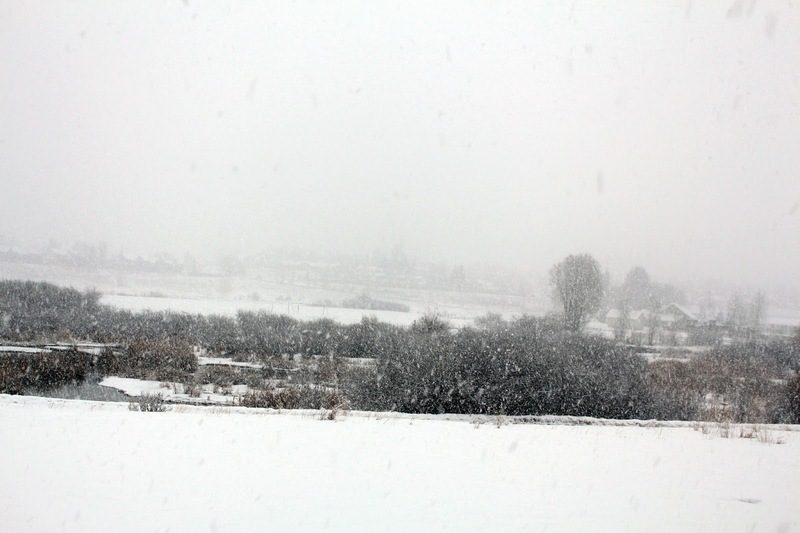 You can vary the widths, but try to use the same height for each row of snow blocks. Working from the base of the igloo, start placing your fondant snow blocks. I added another thin coating of sky blue frosting and wanted a little of the blue to show between the stacking of snow blocks. You could stack the fondant blocks closer or you could roll a large piece of fondant and cover the entire igloo and then use a tool to create the indentation of the blocks. If you clicked through to the foodnetwork cake, they used broken up piece of white chocolate to cover the igloo. You can continue the blocks all the way to cover the dome or stop and add white frosting for snow on the top. 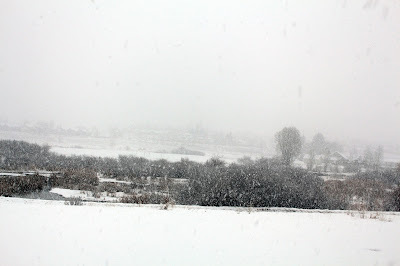 I wanted snow on the top and across the passageway. Last step is to place the penguins. Flatten a piece of fondant and stick to the cake stand and squish the penguin into the fondant to stand. I also rolled small balls of fondant for snowballs to place at the feet of the penguins. The igloo cake was exactly what he wanted to celebrate his 10th birthday. He celebrated his golden birthday with a penguin cake, too. 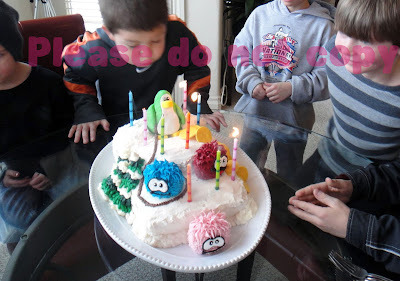 If you missed the Club Penguin cake, click the photo below. Oh the cupcakes. 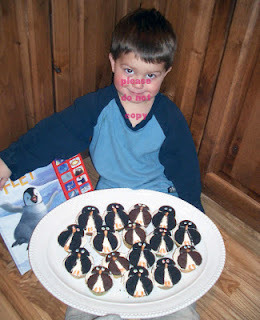 I made these same penguin cupcakes for his 4th birthday. Frost a cupcake with white frosting. Cut a Thin Mint cookie or Oreo cookie in half for the penguin body and use another half a cookie for the head. Pipe white eyes and black eyeballs. I had left-over orange gum paste I used for the beaks and feet, but you can also use orange Starburst candy or even dried apricots. You know you're doing something right when you hear "this is the best birthday ever" year-after-year. Shut the front door! You are so talented! This is fantastic! I love the igloo and the penguins are adorable! Wow - you are seriously talented! Oh my goodness...the talent!! The patience! You've got it going on! WOW! These are *AMAZING*! Truly fantastic!! Thanks for sharing this at my Pin Me Linky Party. Get out! Check out all that awesome detailed work! Love it! Pinned! Thanks for sharing at Two Cup Tuesday at Pint Sized Baker! Hope to see you there again on Monday night! So fantastic! I am adding this to my collection of things to do for birthday parties. You're a genious! these are super cute!! thanks for sharing! looks like alot of work and effort!! hats off to you! Such a cute cake! Thank you for a detailed tutorial!